Anibal Ortiz realized the power of photography during his first assignment as a freelancer for the San Gabriel Valley Tribune. Moments after signing his contract, an editor sent him to the home of a woman in La Puente, Calif., who faced eviction. The woman, who was distraught by her current circumstance, gazed out onto her front porch and told Ortiz how much the home meant to her family. Weeks later, when he bumped into the woman, she thanked him. Because of the photo, the banks had given her extra time to pay her loans and she had been able to keep her home. 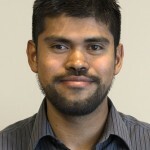 “I want to tell stories that have an impact on what’s going on,” said Ortiz, 26. One of four siblings, Ortiz was born to Mexican parents in South Los Angeles. Racial tensions and violence prompted the family to move to the San Fernando Valley in 1994. He got his start in journalism at Pierce College, where he served as a designer, writer and editor-in-chief of two student publications — then, he picked up a camera. He found that taking photos allowed him to capture memorable expressions that couldn’t be described in words, like the image of the woman gazing out at her front porch. Photography also helped him escape the routine of a desk job. Ortiz, who recently left his part-time job at a catering hall, also photographs weddings. When not shooting photos, he likes to take random nighttime runs. Next May, Ortiz will graduate from California State University, Fullerton, becoming the first in his family to earn a bachelor’s degree. This summer, he will intern at the Minneapolis Star Tribune, where he will continue to pursue his passion for photography. Contact Fausto Giovanny Pinto about this story.